Whether you have a solo, small firm or larger firm practice, the expiration of the lease for the office space where you work within the upcoming two years is an unsurpassed opportunity to assess your future direction. In fact, that is the key benchmark when many firms actually dissolve. The questions raised by a lease expiration go to the heart of whether you want to stay where you are - physically and in terms of your career - or move in an entirely new direction. Your new direction could be to quit your firm and start a solo practice, change firms or leave practice altogether. 1)	Take a macro view and analyze the economics of the firm (revenues, expenses, profitability) within the context of the current lease expense. 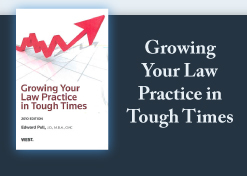 2)	Take a micro view and analyze the economics of your own practice and book of business, and whether they are sustainable under current conditions. 3)	Assess your colleagues from the standpoint of whether you like who you work with and want to continue to do so, even if there were better opportunities elsewhere. 4)	Assess yourself, from the standpoint of whether assuming the risk of a new solo practice, or relocating your current practice, after the lease expires is something you really want to do and are emotionally prepared to do. If you conclude from your analysis that the upcoming lease expiration is the time to move your practice to a new location, take action now with a bottom-up approach. Figure out what you want to pay for monthly and/or annual rent. Thanks to your analysis you can do this in a number of different ways. You can say that historically I've earned X percent profit on Y number of revenue dollars; when I move into new quarters, I expect to earn more revenue - the facilities will be more efficient, I will be closer to prospective clients, the larger space will enable me to hire more staff, and so on. Whatever the expected revenue increase, if I pay the same percentage for occupancy cost, I can pay more rental dollars as an absolute figure... and that number is $X. If you want to be more conservative, assume that your revenue will stay the same even after the move, or simply to conclude that you don't want to pay more than the actual current rental dollars you are paying now. This assessment looks at rental costs from the perspective of your own practice - what you expect in revenues, what you can afford, and what direction you want your practice to go in the right physical environment where you spend most of your waking time. Everyone I've talked to lately says that 2011 will be better than 2010, and certainly better than 2009! Have you taken the time to create your own plan for next year? If not, do so. Make sure you are prepared for the good that will come your way in 2011. What are you doing to make sure you will take advantage of the changing economy and the improved financial condition of many of our clients? For me, this is the time I: i) review my performance for the year and plan my goals for next year, seeking new ways to improve on my strengths and abilities to benefit clients; ii) review my outstanding projects, evaluate and prioritize them for completion; iii) clean out my office, throwing out periodicals I haven't read yet and not likely to read soon - symbolically, this physical cleansing "cleans my head" and gives me the emotional space to focus on what will be important for next year's achievements; and iv) review my relationships with those whom I have outsourced tasks to support my efforts to improve the practice management efforts of lawyers, and enhance or change them. While I may do these things during the year as may be appropriate, this time of year seems particularly timely for this. Rather than take your success for granted or bemoan your current situation, be pro active and make 2011 what you want it to be. Best wishes and much success for you! As always, contact me if I can be an ally on your path to greater success.